The curator and art historian Susan Landauer met Elmer Bischoff in 1985, while she was a graduate student at Yale, and this encounter helped lead to her first book: The San Francisco School of Abstract Expressionism (1996). Landauer went on to organize his retrospective, Elmer Bischoff: The Ethics of Paint, for the Oakland Museum of California (October 31, 2001–January 13, 2002). In her essay for the retrospective’s catalogue, she called Bischoff part of the “Bay Area Figurative triumvirate.” The other two members were David Park and Richard Diebenkorn. "If David Park was the classicist of the founding triad of the group, and Richard Diebenkorn the modernist, Bischoff was the romantic. (Such distinctions seem a bit fussy, however, when you consider that all three were typical American moderns in the pastoral mode.) Park continued painting figures until his untimely death at the age of forty-nine in 1960, whereas over the next decade and a half, first Diebenkorn (in 1967) and then Bischoff (in 1972) returned to abstraction, albeit markedly different from the kinds they had practiced in their youth." Unlike Park and Diebenkorn, Bischoff has never been embraced by New York, and has never had a museum show in this city. I think Berkson gets at one reason why in his characterization of Bischoff as a “romantic,” suggesting that there is too much swoon and idealization in his figurative paintings, and not enough intellect and urbanity for a New York audience, which was raised on the work of Alex Katz, Fairfield Porter, and Jane Freilicher (all of whom Berkson has championed). How else to explain why Elmer Bischoff: Figurative Paintings at George Adams Gallery (June–August 2015) is, according to the gallery press release, “[the first] New York exhibition in 25 years to feature Bischoff’s figurative paintings.” Over the years, I have admired Bischoff’s paintings and drawings, which I have seen in museums and at group shows in galleries, mostly on the West Coast, but I had never seen a large group of his figurative paintings, for which he is best known. If anything, the exhibition at Adams reminded me that Bischoff is the least known of the triumvirate on the East Coast, as his late abstractions have also seldom been seen here. The eleven paintings in the exhibition date from 1954 to 1972, covering all but the first two years that he worked figuratively. I found the experience paradoxical: happy to see paintings from different phases while simultaneously wishing that there could have been a larger selection in a more spacious setting. Bischoff may have gotten his due in San Francisco, but he certainly hasn’t gotten it in New York, and I hardly think of him as a regional painter. The paintings could be divided into roughly three periods. The color of Edvard Munch is an obvious influence on use of sickly greens, dark crimsons and burnt oranges in “Playground” (1954), the earliest work in the show. Henri Toulouse-Lautrec likely inspired the woman’s face in the upper right hand corner. At this point, Bischoff was basing his paintings on preparatory sketches, and had not yet figured out how to incorporate the improvisational methods we associate with Abstract Expressionism into his figurative works. What I find interesting is that Bischoff, by drawing inspiration from late 19th century symbolism and Postimpressionism, seems to be going backward, instead of forward. The largest figure in “Playground” is in a pose of slumped dejection — she feels left out, while the two girls to her left, in the middle ground, are happily flying kites. States of isolation — what we might call the dark side of domesticity and community — are recurring themes in Bischoff’s work. They are also areas avoided by his painterly New York counterparts, where many figurative artists aspired to achieve the cool detachment of the Pop artists and Minimalists. In the cityscape, “Montgomery Block” (1956-59) and the genre painting, “Woman Getting a Haircut” (1962), it is evident that Bischoff has looked carefully at the work of Edward Hopper and other artists who were focused on ordinary life. One reason Bischoff abandoned abstraction was because it was becoming too hermetic, perhaps due to the influence of Clyfford Still. Bischoff is best known for his paintings from the mid-1950s to the late ‘60s, which focus on anonymous figures, usually in urban settings. “Woman Getting a Haircut” fits comfortably into that category. The sumptuous paint handling, moody palette and pearly light could not have been done by anyone else. Is it because of their relationship to Edward Hopper that these paintings are not better known in New York? What is missing from this exhibition is an example of the violent seascapes that Bischoff did during the mid-‘60s. A good example is “Blue Clouds” (1963), which is in the collection of the Art Institute of Chicago. 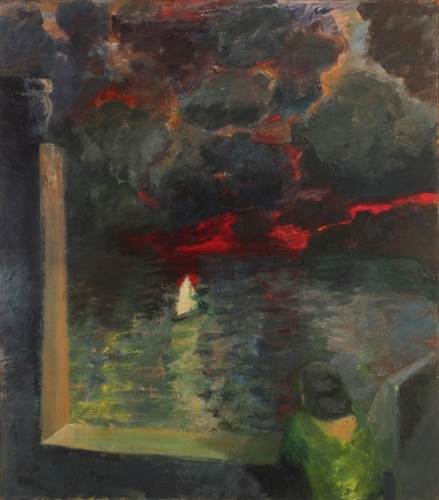 However, by including such figurative works as “Figure at Window with Boat” (1964) and the later mythic paintings, “Figure, Boat, Clouds” (1971) and “Figure with Tree” (1972), the exhibition suggests that there are more sides to Bischoff’s figurative paintings than his urban scenes, and the full extent of what he did between 1952 and ’72, is still unknown, particularly on the East Coast. In the apocalyptic “Figure at Window with Boat” (1964), a woman leans on what I think is a parapet, looking down at a lone sailboat. The sky above is filled with oily black clouds edged in red. I could not help but feel that the painting was inflected by the feelings of unease, terror and fear that gripped America in the aftermath of the Cuban Missile Crisis, the white supremacist bombing of the 16th Street Baptist Church, both in 1962, and the assassination of John F. Kennedy in’63. Inspired by Albert Pinkham Ryder and paintings such as “Toilers of the Sea” (1880) and “Marine–Boat at Sea” (1893-94), what does the sailboat, which also shows up in “Figure, Boat, Clouds” (1971), symbolize? Berkson is right about Bischoff working in a pastoral mode, but he fails to recognize that the dream-like worlds of “Figure at Window with Boat” and the later mythic paintings are obsessed. As someone who preferred Katz’s surface coolness and veneer of sociability, it’s understandable why he would be put off by the turmoil and isolation spreading through Bischoff’s figurative paintings. Bischoff’s skies are too heated up and the churning sea is too rough. The mythic figures are too big and uncomfortable, not quite at ease in the natural world, which is made up of slathers of paint. They know the clouds and waves are evidence of change and dispersal, the inevitability of chaos, and there is little they can do about it. Bischoff comes out of the tradition of American painting that includes Ryder and Hopper, both of whom believed that loneliness was an inescapable condition. Park and Diebenkorn have had museum retrospectives and large monographs devoted to their work. Bischoff deserves the same.